ACTION: Policy Statement; Request for information. SUMMARY: Through this request for information, HHS seeks comment from interested parties to help shape future policy development and agency action. Fiduciary duty for Pharmacy Benefit Managers. Pharmacy Benefit Managers (PBMs) and benefits consultants help buyers (insurers, large employers) seek rebates intended to lower net drug prices, and help sellers (drug manufacturers) pay rebates to secure placement on health plan formularies. Most current PBM contracts may allow them to retain a percentage of the rebate collected and other administrative or service fees. Do PBM rebates and fees based on the percentage of the list price create an incentive to favor higher list prices (and the potential for higher rebates) rather than lower prices? Do higher rebates encourage benefits consultants who represent payers to focus on high rebates instead of low net cost? Do payers manage formularies favoring benefit designs that yield higher rebates rather than lower net drug costs? How are beneficiaries negatively impacted by incentives across the benefits landscape (manufacturer, wholesaler, retailer, PBM, consultants and insurers) that favor higher list prices? How can these incentives be reset to prioritize lower out of pocket costs for consumers, better adherence and improved outcomes for patients? What data would support or refute the premise described above? PBMs will provide disclosure of important contract details to a level demanded by the competitive market and generally rely on the demands from clients for delivering radical transparency in their contracts. 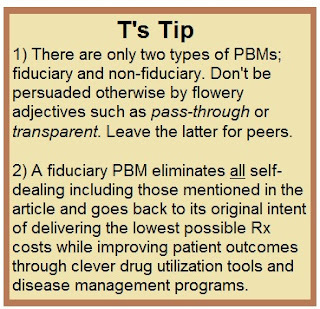 In other words, PBMs have learned how to leverage the purchasing power of the unsophisticated plan sponsor to their financial advantage. The truth is most, if not all, of the excessive costs embedded in non-fiduciary PBM service agreements can be eliminated if stakeholders (HR execs, CFOs, benefits consultants, brokers etc...) concern themselves less with self-preservation and more with self-education. Should PBMs be obligated to act solely in the interest of the entity for whom they are managing pharmaceutical benefits? Should PBMs be forbidden from receiving any payment or remuneration from manufacturers, and should PBM contracts be forbidden from including rebates or fees calculated as a percentage of list prices? What effect would imposing this fiduciary duty on PBMs on behalf of the ultimate payer (i.e., consumers) have on PBMs’ ability to negotiate drug prices? How could this affect manufacturer pricing behavior, insurance, and benefit design? What unintended consequences for beneficiary out-of-pocket spending and Federal health program spending could result from these changes?